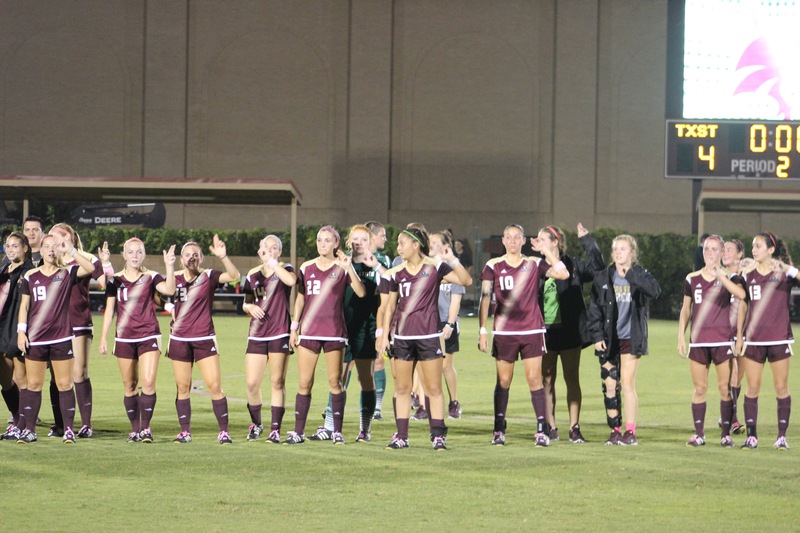 At the beginning of the pre-season, the Texas State Women’s soccer ranked 3rd in the coaches poll. The regular season ended at 12-5 overall, and 6-3 in conference play and sit at 3rd in the Sun Belt Conference standings. The pre-tournament banquet of the 2015 Women’s Soccer Championship in Atlanta, Georgia took place last night and individual awards were given, among the awards was Texas State senior forward Lynsey Curry. Lynsey Curry lead the conference with eight goals, but had her own 10 goal and six assists career high. Lynsey Curry was also the Sun Belt Conference offensive player of the week twice this season. Curry was also awarded to the All-Sunbelt first team. Junior forward Lauren Prater and sophomore defender Chandler Cooney were both awarded to the All-Sun Belt second team. The selections were made in a vote by the league’s 10 head coaches. Texas State won the last 4 games of the season to position themselves as the #3 seed of the Sun Belt Conference. The Bobcats have found a rhythm at the right time as they have really come together to win the last two home games, with one being Senior Day. On Senior Day Lauren Prater scored her 12th goal of the season. Lauren Prater expressed her thoughts on what was going through her mind when she scored her 12th goal of the season. Assistant Coach Link Scoggins says the wins are important, but he says that until the tournament starts they need to minimize the mistakes they can fix. Scoggins has been there for the last 11 games, ever since Alumni Weekend. Scoggins also states that it doesn’t matter who they get in the tournament and they will make their due diligence to win those three games. Link Scoggins really likes what he has seen with his team when it comes to scoring for the Bobcats. He says that he is confident that the midfield can help with the production that Lynsey Curry and Lauren Prater have had. Goals, coming from Clarissa Leon, Lauren Prater, and Lynsey Curry, and that is a good thing for coach Scoggins. The Sun Belt Conference Tournament will now take place in LakePoint Sporting Community in Emerson, GA due to the amount of rain that has fallen in the Atlanta area, Georgia State’s home field is not able to host the tournament. The Sun Belt Conference-Quarterfinals will begin for the Bobcats on November 4th at 6 p.m. vs #6 Georgia State Panthers. Texas State leads an overall record of 3-1 against the Panthers.